What is your website telling potential customers about you? Your website—it really is the first impression many people have of your company. What is your website saying about you? At Imago our goal is giving you a website that represents the professionalism, and quality of your brand. Please contact us to discuss custom website development. Having something specific in-mind for your website? We can help you bring your vision to reality. We’ve worked in the custom web-design and development space since 1999, and can create a unique and memorable website for your company or brand. Our custom websites range from minimal informational sites, to fully interactive e-commerce websites. Contact us to talk through your project in detail—our initial consultation with you is absolutely free. Is your budget tight? Want to get your website up quickly? A SimpleSite may be just the ticket for your business. A SimpleSite is a quick, cost-effective way to get your company website and/or blog up and running in no-time. 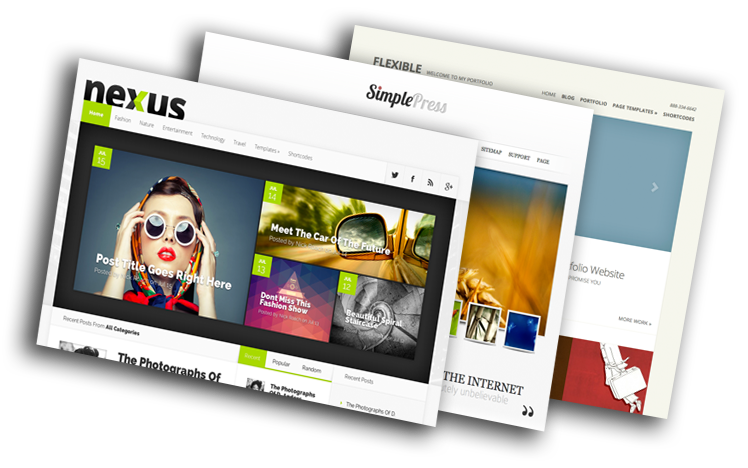 We’ve got a number of professionally designed themes for you to use that give you the most bang for your buck. This solid foundation will also grow with you—allowing you to add features and even a custom design as your budget allows. You can choose from one of our many available themes for your website, and then we will provide some basic customization (like adding your logo, and minor color adjustments). The best part? Our SimpleSite’s are all built on the same industry standard content management system as our custom websites – so should you decide to upgrade to a fully customized website later, you pay only for the design. Each of these supplemental enhancers will dramatically improve your basic SimpleSite, and add a ton of value. Keep in mind that everything included below can be done yourself using the intuitive content management system built into your new website. Sometimes however, it is better to leave it to the professionals – and that’s where we come in. Custom Designed Website Enhancer. This includes a completely custom design for your new website; we will work with you to create a unique and memorable design that will set your website apart from the rest. Content Built-Out Enhancer. We will custom tailor your initial content to fit your new website. (up to 15 pages). All content must be provided by client in email or digital document form, and may include images, text and/or video. All grammar and spelling is the responsibility of client. Plugin Setup Enhancer. We will install a basic set of common and useful wordpress plugins for your new website including: Gravity Forms with 1 form setup, Social Media Widget, Auto posting to Twitter and Facebook, All in SEO plugin. Customize Header Enhancer. We will customize the design of your new SimpleSite’s header to match your company’s identity or brand. This service is included with our Custom designed website package. Keyword Research Enhancer. We will research the best keywords for your business and/or industry, and implement those keywords in your website, as well as make recommendations on how to improve your search engine placement. Freshness Enhancer. One key to keeping people coming back to your website is freshness; how frequently you update your content. Is it stale…or is it fresh? With this package we will custom write 4 posts a month of fresh content relevant to your industry. All content is reviewed by you prior to posting, and allows your website to really add value to it’s visitors. Email Marketing Success Enhancer. While we offer a basic email marketing program, but this package is designed to multiply your efforts at connecting with current and prospective clients. With this program we setup the email marketing system, install lead-generating widgets onto your website, and setup 5 automatic drip-marketing emails to your system. These automatic emails multiply your efforts, and can be configured in the means best suited to your business. Typically, we setup an auto-responder email for the first email; this can be configured to send a special message to your clients after a special date, like an order, a visit, home-show or some other definable thing. We then setup 4 additional emails that are spaced at whatever intervals work best- to automatically followup with your client, lets say 15 days after the sale, and then 45 days after, and then a few months later. This way, from one simple entry into the marketing system, you have contacted your customer 5 additional times with zero additional work! Drip Campaign Add-Ons. We can add an additional 5 auto-drip emails to your system. Remember, you can add as many triggered emails as you wish using the system, but with this package, we do the work for you! The experts at Imago Studio are ready to help. Contact us for more information.